•	Many people start in self-employment without a clear vision for what they want to achieve. •	In this session we’ll take time to design YOUR ideal business. •	By the end of the session you will have a clear understanding of what you’re going to be working towards in your new business. Before we start to discuss the detail of what you are trying to achieve, there are two key things that you must do when looking at goal setting. The first is to actually write down your goals – studies have shown that people who have written goals accomplish more that those who don’t. Secondly, it is no use having vague ideas of what you want to achieve: such as just ‘more time’ or ‘more money’, you need to specifically set out what it is you are aiming for. 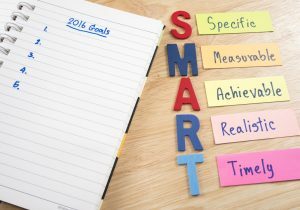 A great way to do this is the SMART system for goal setting. Specific – you have to define it specifically rather than generally, so that you know exactly what you are aiming for. Measurable – you have to be able to see if you have hit your goal, so after defining what you want to achieve you then have to record your results towards it. It is therefore important to pick goals that can be easily measured. Realistic – whilst you might want to be the number one person in the country in your field, you need to consider if this is a realistic goal for a brand new business. And Timely – you need to set a date on when you want to achieve your goal, so you will know if you have hit your target in the time you set. If so, then exactly what does that look like for you? You might be fed up of wasting hours commuting or working long hours. With your own business you can choose your own hours to fit in with your needs and match those to your clients. Perhaps you’d like to work weekends and take time off midweek to do things when they are less busy? That is certainly an option. Perhaps you want to take longer holidays than your standard employee holiday allowance allows. However, I will cover in the next session something that you do need to be very aware of when looking at working fewer hours as your goal. If so, how much do you want and when do you want it by? For many people they can see how much their employer charges the client and then compare it to how much they are paid. There is usually a big difference. Of course a large business will have overheads to cover, but as a small business you have the potential to both charge your clients less and to also earn more yourself. With your own business the earnings potential is directly related to the amount of time and effort you put into the business. Once the business has matured then you could find that you are earning more than before, and also working fewer hours than before – but as mentioned I am going to cover in the next session what could disrupt you. At this stage it is important to stop and take some time to write down your SMART goals that you want from the business as that is what we will be working towards on this course. To conclude, the ideal business design is YOUR ideal business design – no-one else can design it for you and it will differ for everyone. Once you know what it is you want to achieve from the business then the work you have to put in will be worth it as you will be able to see the effort taking you nearer to your goal.